Halifax braved through its driest days by with the help of some brazen bootleggers. 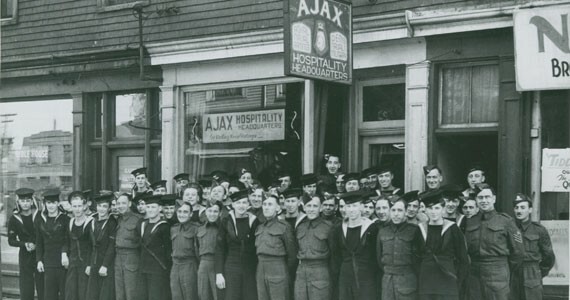 Dolly McEuen’s famed Ajax Club. It's the oft-touted folktale of boastful pub crawlers that Halifax has the most bars per capita of any city in the history of the universe. True or not, it certainly isn't hard to find a pint in the downtown. These streets weren't always so sudsy, though. Prohibition, the 1920s American movement designed to supply a future Steve Buscemi with steady work, didn't stop at the border. Temperance's tendrils wound through Nova Scotia as well as anywhere else, turning Halifax from wet to dry. Calls for prohibition were being heard in Canada from the dawn of the 19th century. In Nova Scotia, the movement only started to gain steam after the 1850s. Spurned on by local chapters of American organizations like the Sons of Temperance, church leaders and suffragettes attempted to sway public opinion away from the sinful nature of spiritous drinks. County after county voted to outlaw alcohol as the decades rolled on, but booze would remain stubbornly legal in Halifax. Finally, dealing with the shortages of World War I and near voter revolt, the politicians caved. On June 30, 1916, Halifax sobered up. Newspapers from the time recount that in the days before the new laws took effect, thirsty customers bought out the drink supplies of the city's saloons and pharmacies. Panic aside, the city took pretty well to its new sober state. Just one week after prohibition, Dartmouth ferry officials were delighted to report to the Herald that "No drunks on the last boat now." Convictions for public drunkenness in Halifax County actually fell by nearly a third, while oddly the number of arrests increased in the rest of the province. Of course, just because people weren't drunk outside didn't mean they weren't drinking at home. There remained many avenues to purchase healthy beverages. Trucks of liquor were steadily run in from Montreal under the cover of hay or other unsuspicious cargo. Certain unscrupulous Nova Scotian doctors, a century before oxycontin came around, were also quick to offer alcohol as a cure-all for common maladies. As noted in the provincial archives, one small town had two doctors give out over 2,800 prescriptions in a single month. Then there was all the liquid flowing in from St-Pierre et Miquelon. The French-controlled island was a quick trip from the docks of Cape Breton, making it an ideal spot for smugglers to load up. Al Capone himself supposedly visited the island. It's said that upon realizing how much noise shifting crates of booze caused, Al ingeniously decided to start loading bottles in straw-filled burlap sacks. According to St-Pierre's tourism information, this led to over 350,000 wooden crates being dumped on the island's shore. It's claimed nearly all the houses on the island from that period are built from those discarded crates. Being a naval province to begin with, Nova Scotians took to bootlegging and rumrunning like fish to water. The ever-strained fisherman was able to make a nice side career out of smuggling spirits, or if he preferred, he could just rent his boat for a few months to American gangsters and pocket the cash. New boat registrations at the time skyrocketed, as our world famous shipyards churned out specially built smuggling crafts that took to the seas every night, heavy with booze. It was estimated that by 1925, at least half of Lunenburg's fishing fleet was engaged in illegal cargo shipment. It wasn't just the sailors having fun, though. Back on land, there were plenty of distilleries and bootleggers moving product through the province. Spurred on by suffrage, the women of Nova Scotia also took a particular shine to criminal enterprise. Carrie Bradbury of Halifax became the first person in the city ever sentenced for the illegal sale of alcohol, only a month after the county went dry. She received 20 days in jail for her efforts. There was also Catherine Holland, AKA Queen of the Bootleggers. A no-nonsense smuggler with a gang of men at her command, Holland was arrested many time but would inevitably have a "boyfriend" appear at the courts to plead guilty to her crimes. One particular paramour filled in for a vacationing Holland before a Royal Commission of Inquiry in Halifax. He maintained that the accusations against his lady love were "merely spite and jealousy" from the newspapers. Likewise, a woman helped Halifax drag itself out of prohibition during World War II. Nova Scotia officially legalized the government sale of alcohol in 1929, but Halifax was still pretty barren for public houses when Janet Evelyn "Dolly" McEuen arrived a decade later. A naval wife, McEuen wanted to provide refreshments for the many thirsty sailors stationed in Halifax. Securing a mansion on Tobin Street, she opened the Ajax Club, a cozy joint where for 10 cents a man could "enjoy a glass of beer in decent surroundings." The Oland's brewery even supplied the popular new speakeasy with a station wagon for transporting visiting sailors and empty bottles alike. Sadly, the Ajax Club's life wasn't long. Its liquor license was revoked in 1942 under pressure from church leaders. Even in just three years of operations, though, the club's popularity had spread across the country. The Montreal Gazette lamented the Ajax's cessation of operations, noting that within the rest of Canada there are "few of whom share the Haligonian attitude toward liquor refreshment." Gradually, the city would crawl out of its temperance temperament. These days, the Haligonian attitude toward liquor refreshment would charitably be described as gratuitous. Our many bars and breweries often cloak themselves in the past, idolizing in atmosphere and content the pirates, bootleggers and beer mavens that suffered so harshly under Prohibition. In that spirit, feel free next time you're out for a pint to raise a glass and toast to all those that couldn't. But please, drink responsibly.